US Hair Restoration is an Orange County hair transplant center dedicated to the treatment of hair loss using the most advanced techniques for hair transplant surgery. 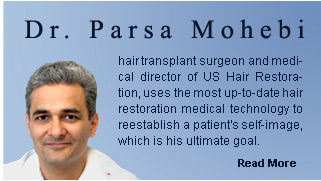 Dr. Mohebi, medical director of US Hair Restoration, is one of the most up-to-date hair loss doctors and hair transplant surgeons in Orange County. US Hair Restoration provides a variety of medical services to those who suffer from different types of hair loss. We specialize in providing a master plan to treat your specific hair loss which may include medications, hair transplant and even styling and cosmetic recommendations that can help you enhance your appearance and restore the youthfulness of your hair. Providing quality hair transplants with affordable rates, our state-of-the-art hair transplant procedures make US Hair Restoration the first choice for hair transplant for Orange County residents including Irvine, Newport Beach, Laguna Hills, Costa Mesa, Huntington Beach, Santa Ana, Anaheim, Mission Viejo even San Diego and as far as Arizona residents.